Hyper-parameter : shape parameter for the Gamma distribution prior over the alpha parameter. Default is 1.e-6. Hyper-parameter : inverse scale parameter (rate parameter) for the Gamma distribution prior over the lambda parameter. Default is 1.e-6. If True, compute the objective function at each step of the model. Default is False. threshold for removing (pruning) weights with high precision from the computation. Default is 1.e+4. copy_X : boolean, optional, default True. estimated precisions of the weights. For an example, see examples/linear_model/plot_ard.py. D. J. C. MacKay, Bayesian nonlinear modeling for the prediction competition, ASHRAE Transactions, 1994. R. Salakhutdinov, Lecture notes on Statistical Machine Learning, http://www.utstat.toronto.edu/~rsalakhu/sta4273/notes/Lecture2.pdf#page=15 Their beta is our self.alpha_ Their alpha is our self.lambda_ ARD is a little different than the slide: only dimensions/features for which self.lambda_ < self.threshold_lambda are kept and the rest are discarded. fit(self, X, y) Fit the ARDRegression model according to the given training data and parameters. predict(self, X[, return_std]) Predict using the linear model. 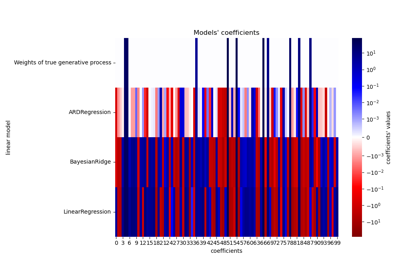 Fit the ARDRegression model according to the given training data and parameters.